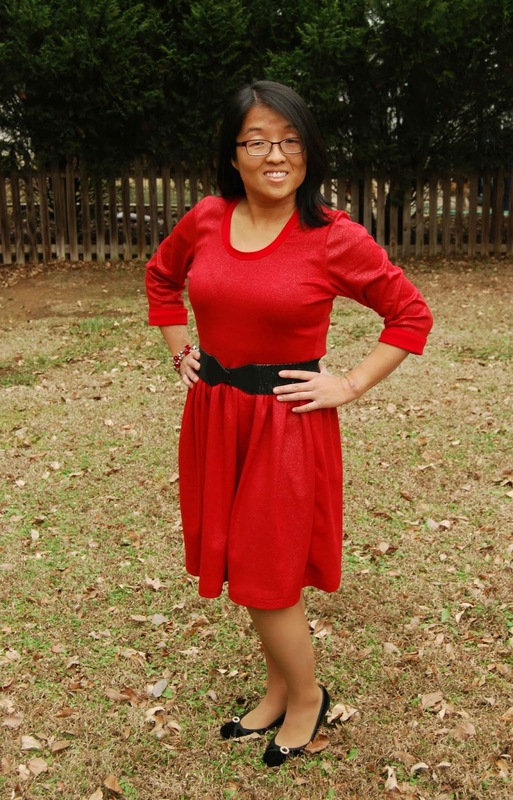 Waaa-aaay back in August, Caroline H. (the brains and beauty behind Sew Caroline Sewing Patterns) asked me to review one of her PDF sewing patterns on All Things Katy! 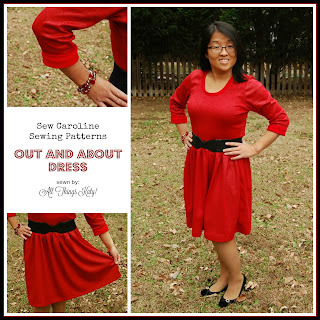 I chose the Sew Caroline Sewing Patterns Out and About Dress. I purchased this lovely red, sparkly ponte roma from JoAnn's (also) back in August when I was visiting my out-of-state aunt. I just KNEW I had to have a Christmas dress out of it! 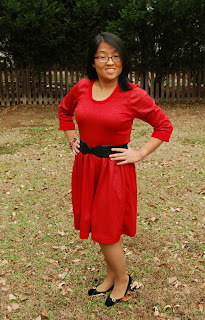 The Sew Caroline Sewing Patterns Out and About Dress was the perfect PDF sewing pattern to bring my me-made Christmas dress vision to life! -The Sew Caroline Sewing Patterns Out and About Dress is sized for XS-XL. -The Sew Caroline Sewing Patterns Out and About Dress includes two hemlines (knee and maxi) and two sleeve lengths (elbow and long). -The Sew Caroline Sewing Patterns Out and About Dress includes a pattern piece for optional in-seam pockets. -The Sew Caroline Sewing Patterns Out and About Dress is written for KNIT fabrics (something with a stretch). -The Sew Caroline Sewing Patterns Out and About Dress includes a pattern sizing, finished garment and yardage requirement charts. -The Sew Caroline Sewing Patterns Out and About Dress includes step-by-step photographs and written instructions. -The Sew Caroline Sewing Patterns Out and About Dress pattern pieces are nested (but not layered) and pages must be trimmed before assembling. -I subtracted 1/2" length from the top of the skirt pattern piece. -I subtracted 2" length from the bottom hem of the skirt piece. -I subtracted 1" length from the bodice, 2" up from the waist. *I was told that The Sew Caroline Sewing Patterns Out and About Dress is drafted for an average 5'-6" tall woman. The Sew Caroline Sewing Patterns Out and About Dress came together quickly and easily. The pattern pieces lined up perfectly- there was no "fudging" to make things fit. The notches in the sleeve pattern piece were really helpful in constructing the bodice. Plus, the sleeve of The Sew Caroline Sewing Patterns Out and About Dress is an actual pattern piece- with a different back and front- not just a pattern piece cut out on the fold. This helps create an overall, better fit. The pictures were clear and complimented the written instructions. I never hesitated or wondered how to proceed while sewing up the The Sew Caroline Sewing Patterns Out and About Dress. It took me less than three hours to sew up The Sew Caroline Sewing Patterns Out and About Dress (from printing to final try-on). 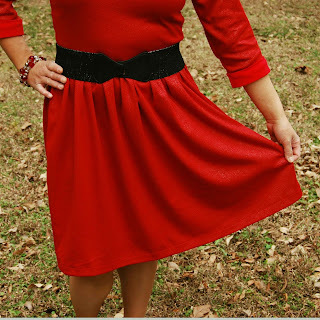 The scoop neckline of The Sew Caroline Sewing Patterns Out and About Dress is just right- not too low, and not too high... Just riiiiiight for any holiday event from office Christmas party, date night or Christmas Eve church service. 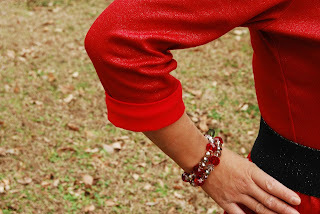 I LOVE that the elbow length sleeves are finished with a cuffed hem!! For some reason, it's just so much easier to just sew on a cuff instead of folding up, pressing and sewing. Plus, the cuffed hem adds a nice design element- it's the perfect opportunity to add a complimentary fabric, a button accent, etc. I took out a total of 3 1/2" of length from the pattern pieces. I've always been told to take out 1/2" for every inch you are shorter than the pattern is written for (The Sew Caroline Sewing Patterns Out and About Dress was drafted for the average 5'-6" tall woman). In retrospect, I realize that I could have stood to take out even more length in both the bodice and the skirt. Even with my alterations, the waist seam (where the bodice and skirt met) still hit me at a funny height (hence, the belt ;-P). The skirt hit just below the knee caps. Also, the sleeves hit me more like 3/4 long sleeves (than elbow) and personally, I prefer them this length. I love how versatile The Sew Caroline Sewing Patterns Out and About Dress PDF sewing pattern can be. Dress it up with fancy fabrics. Or, dress it down with casual jersey knit. With multiple sleeve and hem lengths, you could potentially sew multiple variations of the same dress for all seasons of the year- love that! In conclusion, The Sew Caroline Sewing Patterns Out and About Dress was a fast, simple sew that resulted in a fun, festive dress. I love the different options included in the pattern and I appreciate how well everything went together. I know I'll be sewing up more Sew Caroline Sewing Patterns Out and About Dresses! Would you like to learn more about Sew Caroline Sewing Patterns?